Why is this important? Because as you may have guessed, most students do not pay the total cost of attendance. So how do you know what you’ll actually pay? The reality is that you won’t know for sure until you have received your financial aid award from the specific school. However, there are several tools to help you get a better idea of what college is going to cost. Knowing your Expected Family Contribution (EFC) is a big first step. Also, the College Navigator website lists average net price for students for the past three years broken down by income level for each college. The following example is for Trinity University. It will also provide a link to the college’s net price calculator which should provide you with an even better estimate of your net price. 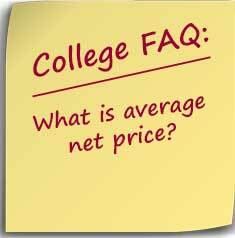 The College Board also provides a net price calculator which can be useful if you are applying to schools that require the CSS PROFILE. Average Net Price does not include any loans or work-study often referred to as self-help aid. Some school’s net price calculators will include a figure called “net cost” to the student or something similar which will often include loans. This is not the same thing as College Net Price. It’s important to remember that the Average Net Price is an average based on the previous year. Depending on your family’s financial situation, your price could be very different. This is why it’s important to estimate your EFC and use Net Price Calculators as soon as possible.